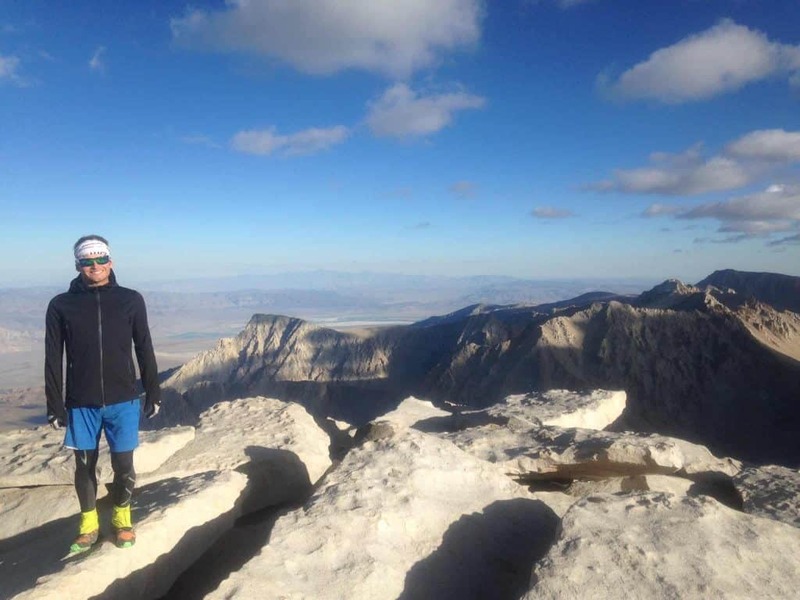 This post comes from Chris Cloyd, a TMS Ambassador and lover of endurance sports. When Chris isn’t training for his next big race or out exploring the Eastern Sierra on foot or bike, he’s managing the Performance Training Center by Julia Mancuso. 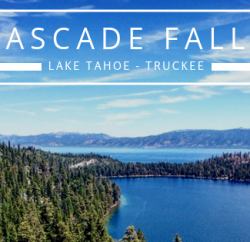 Watch for more race reports, gear reviews and fun reading from Chris and other Ambassadors of Tahoe Mountain Sports. A perfect day to bag four peaks! I’ll always remember this past summer fondly, and with great reverence. This was the season that redefined sport and what is possible (for me) in the mountains. It was an exciting season, and one that I look forward to building on in 2015 and beyond. By far the most ambitious day on my calendar was October 19th, 2014 – a planned single-push assault on Mt. Carrillon, Mt. Russell, Mt. Whitney, and Mt. Muir in one day. To prepare for the event (not to mention the months of mountain running and some climbing and overnight efforts to build the muscular and psychological endurance necessary for such a undertaking) I arrived 2 days early to the East Side and met up with my partner for the trip, Michael Jaskot. 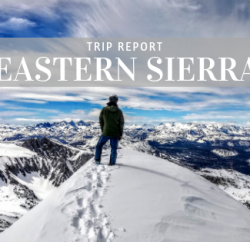 Michael is a tremendously talented mountain athlete and has much more experience in the big mountains of the Eastern Sierra than I do, so his company was greatly appreciated during this trip. We decided on a long, steady hike up Mt. Langley (to be my first 14er in California) on the 18th to get our bodies acclimatized a bit, and to check our gear and nutrition/hydration strategies. The route to the summit of Mt. Langley is a straightforward one, albeit a daunting 20 miles round trip with over 4,000 feet of gain (and identical loss coming back down). No real scrambling is necessary to summit Mt. Langley, and you could make it up and back with your hands in your pockets if you wanted to. We took things casually, starting around 5 AM from the Cottonwood Lakes Trailhead. We hiked straight through (very little running for this outing, as we were up there strictly to rehearse for the big day to come and wanted to save our energies) to the last of the Cottonwood Lakes before the slog up Army Pass. You can easily ascend Langley via Old Army Pass or New Army Pass, but New Army Pass adds a respectable amount of distance and we wanted to keep things as short as possible for today’s outing, so we chose the old Army Pass route. I took a more “creative” route up that branched off from the main trail and ascended a chute from the plateau above, adding some mild difficulty, but we gained the pass without much struggle. From their it’s a short walk up a scree and talus field to the summit, shepherded by the biggest cairns I’ve ever seen. Honestly, they’re 6 feet tall. The park service organized a massive effort to get them made up there to prevent more “creative” routefinding and limit erosion on Langley’s upper slope, and they outdid themselves. It’s worth the trip up there just to see the craziness in person. Once we gained the summit we enjoyed our lunches, took some photos, and got started on our descent. Some casual conversation and quick running efforts to stretch our legs got us back to the trailhead around 2:30. We headed down into town to meet some friends of ours that were also tackling Whitney and its neighbors on the 19th and enjoyed a great dinner and a lot of fun conversation about our upcoming adventure in the mountains. We topped off our water, gathered a few more supplies, and headed up to Alabama Hills for a few hours of sleep. We chose a minimalist “camp” spot with flat ground, a place to lay our heads, and a good view of the stars. Proximity to the Whitney Portal Trailhead was our biggest motivator in choosing our location for the evening, as we wanted to get an early alpine start to afford ourselves the best chances of success on our mission. Loving the Salomon S-Lab Advanced Skin 12 Running Vest! Rising well before the sun (4:15 AM, if memory serves), we got our gear together, Jetboiled some coffee and oatmeal, and topped off our fuel for the day to come. For this undertaking, I used Salomon Speed Cross trail shoes (more grip and support for the light climbing we’d be doing), gaiters (a MUST for anything fast and light in the Eastern Sierra, in my opinion – they’ll save you a ton of time you’d be foolishly spending emptying rocks out of your shoes every 20 minutes), compression tights under running shorts, a light technical t-shirt, a thermal full-sleeve base layer, and a light but insulating hooded jacket as my base apparel. Layers came and went as the temps and activity dictated, but I feel very good about the choices I made for this trip – I was never wanting for more warmth or more breathability. I also used a basic headband and full-finger gloves not only for warmth but for protection from the sun and from skin abuse with all of the scrambling we’d be doing. 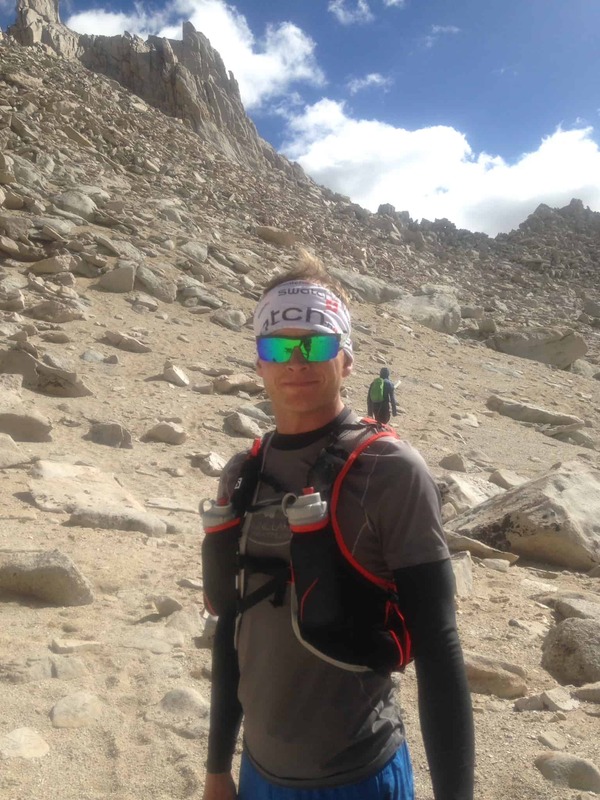 All of my nutrition and hydration (along with maps, a headlamp and extra batteries, sunscreen, electrolyte tablets, a water purifier, a compass, and my cell phone and GPS) was carried in my Salomon S-Lab Advanced Skin 12 running vest. I can’t say enough positive things about this product – it has enough space (12 liters!) 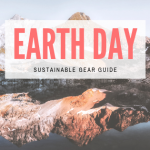 to carry everything I need on overnight runs and adventures, but is light and low-profile enough to run with when I only need few bottles of water and a map. My nutrition consisted of enough assorted endurance fuel to average about 250 calories per hour, including bars, gels, drinks, nuts, and a peanut butter and Nutella sandwich. I carried a maximum capacity of 52 oz of water at any given time, and planned on refilling twice during our day. 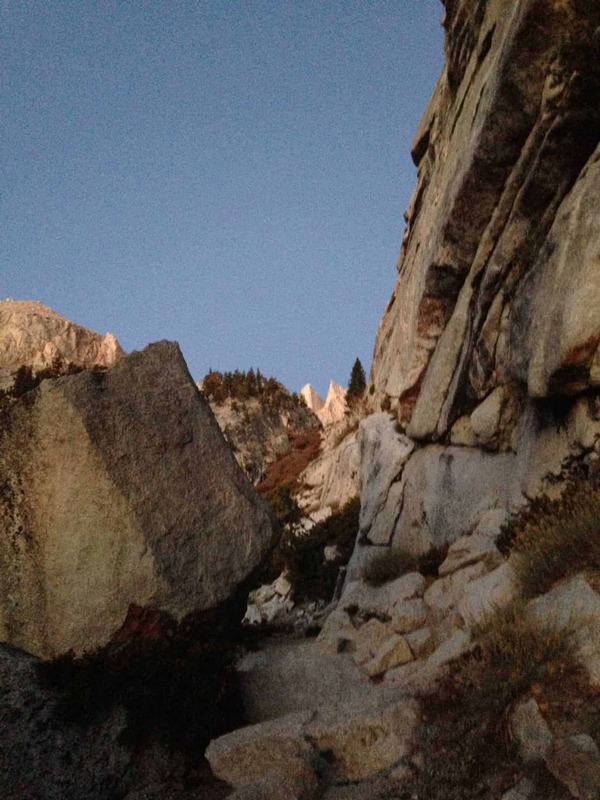 We all got ready, loaded up, and to the trailhead by 5:15 AM, and set out from the Whitney Portal (after some last minute bathroom breaks) at 5:30 AM. 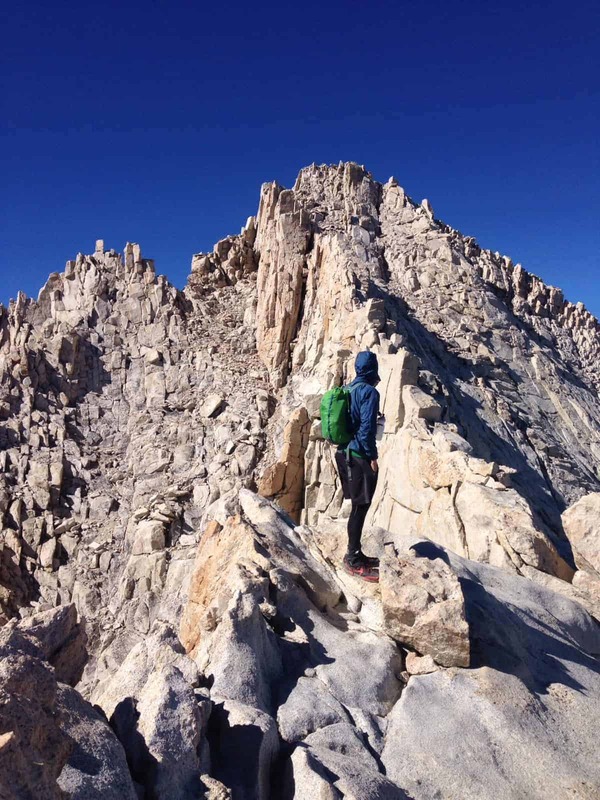 Our friends Chris, JP, and Anna Mae set out with us, but Chris and JP quickly blazed ahead on their own mission directly to the summit of Whitney. Anna Mae joined Michael and I for the first part of our day, and we kept our own tempo. Michael and I’s day was going to be longer than the rest of our group, and we were intent on pacing ourselves accordingly. We followed Muir’s Mountaineer’s Route up past the Ebersbacher Ledges at sunrise and on to Lower and Upper Boy Scout Lake. Nothing crazy so far, but we stopped to pound some water and top off our reserves ahead of the next leg of our trip – a drawn out scramble up to the Russell-Carillon Col, a summit of Mt. Carillon, a climb up the East Ridge of Mt. Russell, and a downclimb/traverse from the summit of Mt. Russell to the Whitney-Russell Pass and down to Iceberg Lake. This entire section would be without opportunity for water, so we wanted to make sure we were well supplied. We left Upper Boy Scout Lake and took the Rockwall Variation approach up some of the South-facing chutes to the col. I can’t say whether this approach is easier or harder, but it seems to be the most direct and seemed to be our best chance for a timely summit of My. Carillon. The Rockwell Variation included some heady class 3 climbing through fields of boulders and talus, and many vertical feet of loose scree – of the “1 step forward, 2 steps sliding back” variety. This wasn’t my favorite part of our day, but I looked back on it fondly once we gained the col. From there, it wasn’t more than 15-20 minutes of 3rd class climbing to the summit of Mt. Carillon and our first peak of the day. Michael, Anna Mae and I enjoyed a few moments on top, signed the register, took some photos, and headed back to the col. From here our efforts were to be applied to the East Ridge of Mt. Russell, one of the more renowned 3rd class read: California 3rd Class, (read: hairy and scary and awesome) routes in the Eastern Sierra. 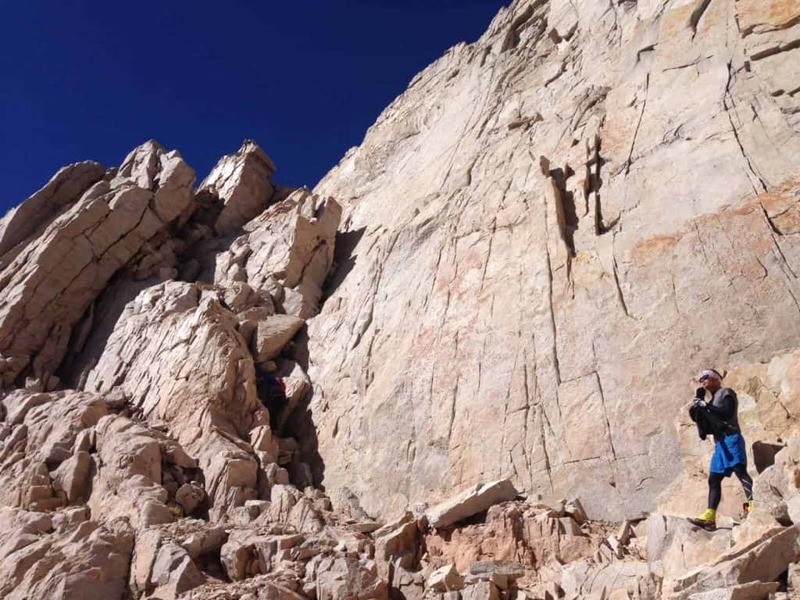 I asked my teammates if I could lead this leg of our day, as I had built this section of climbing up in my head and wanted to make my climb alone and immersed. This section of climbing was by far the most transcendent of my young climbing life, and I look back on it with the fondest of memories. 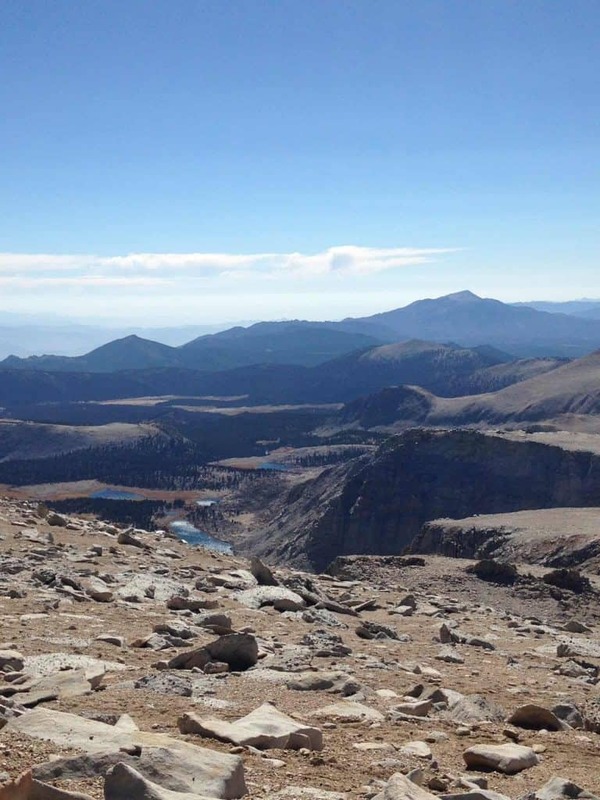 I flowed through the route to the East Summit, navigating simple yet committing movements (the exposure is maddening on this route), and on to the true Western Summit of Mt. Russell with exuberance, and I arrived at the summit at about 1 PM. 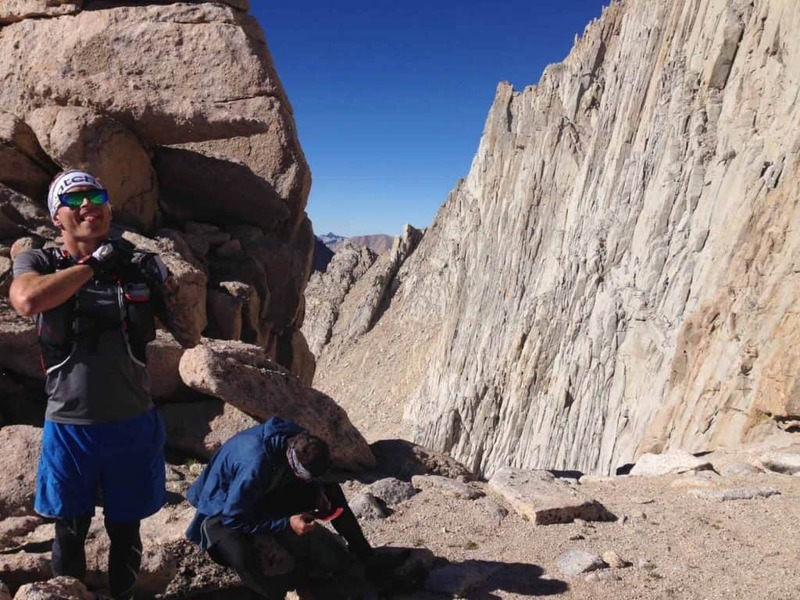 A pleasant surprise, JP and Chris summited at about 1:20 PM – they had summited Whitney and down climbed the North Face of Whitney to Whitney-Russell Pass and then up southern route to Russell. Anna Mae and Michael arrived at about 1:30, and we all enjoyed a long lunch amidst breathtaking views of the Whitney Zone from our summit perch. Together, the four of us downclimbed from Mt. 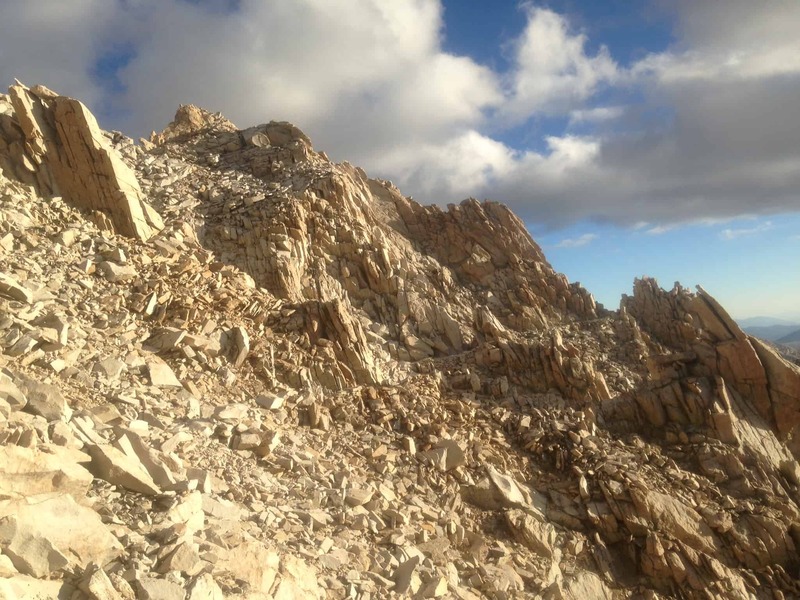 Russell to a scree slope, then surfed/glissaded the loose rock down to the plateau that affords access to Whitney-Russell Pass. From there, we ran down to Iceberg Lake to top off our water before making our push up to the summit of Mt. Whitney. 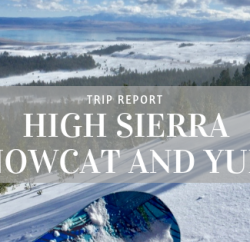 At this time, JP, Chris, and Anna Mae wished us well and started their descent back to the trailhead – their day was over. Their goals were different, and their time-table was more limited. Getting ready to tackle Muir’s Mountaineer’s Route. 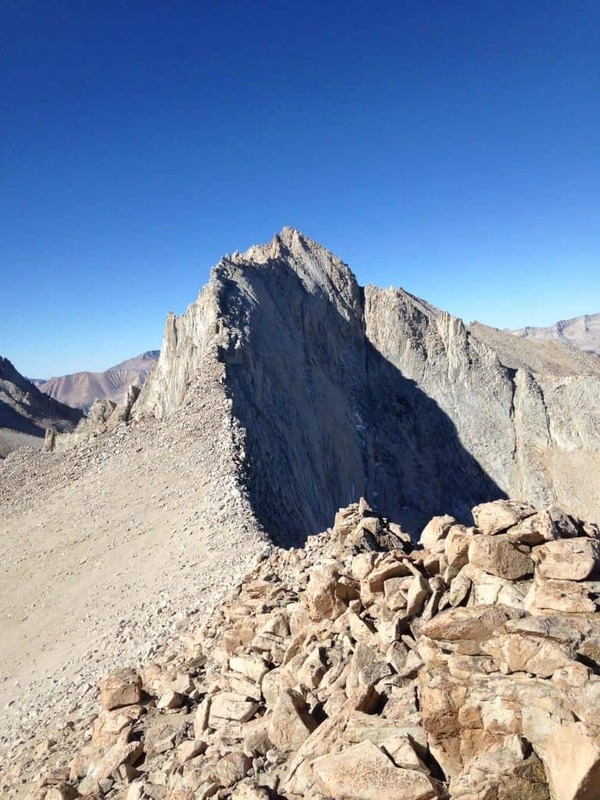 Michael and I aligned our focus and began our climb up the upper portion of Muir’s Mountaineer’s Route together. We split up briefly, flanking the chute splitting Whitney itself, due to ice and snow on the route, and simultaneously soloed our own routes up to the first bench. The climbing was no more than class 3, but the snow and ice forced us to apply our full attention. From the first bench, we took the route proper – a short but technical maze of ledges and cracks holding patches of verglass – up to the summit plateau of Mt. Whitney. At 4 PM, we stood on top of California’s highest peak. We took our time to read through the register a bit, leave our names, take some photos, and chat with some climbers as they crested the East Buttress in their own successful summit bid. After they left, Michael and I were alone on the summit – a real rarity on a mountain as popular as Whitney. With work left to do, we ran down the Mt. Whitney Trail toward the trail crest and Mt. Muir. I was engulfed by the experience – the aesthetic of running at that elevation, in that environment, is intoxicating. So much so that I ran right past the approach to Mt. Muir and added about 3/4 of a mile and 400 feet of vertical to our day. Michael forgave me (of course he understood), but I was frustrated with myself for adding to our challenges on this day. Of course, without hesitation, we turned around and RAN back up the trail with all of the angst my error had fostered and gained the approach to Muir by 5 PM. The summit block of Mt. Muir is easy enough, but 4th and 5th class sections lie in wait should you lose the traditional 3rd class route to the top. 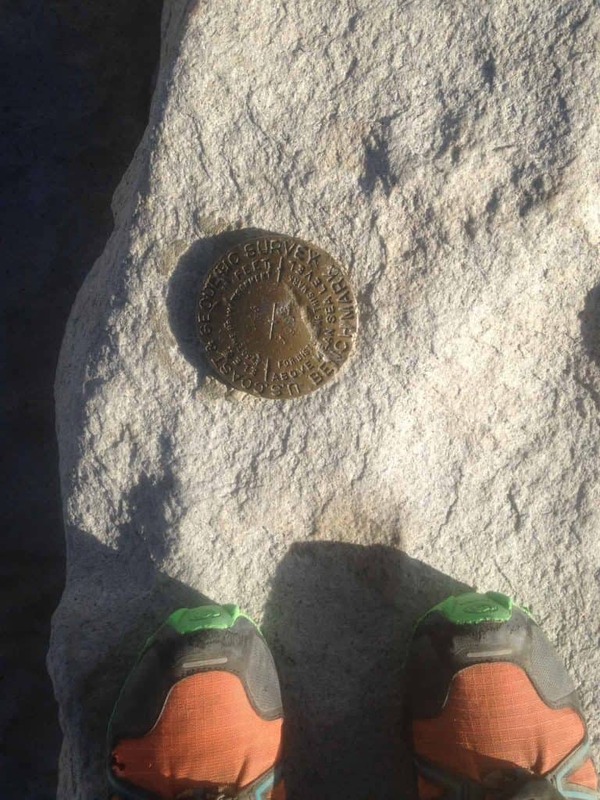 Of course, with 12 hours of moving under our feet (and weighing on our heads) at this time, I lost that route and put myself in a committed position with 2 crimps and a poor exit just before the summit. The lesson, as always: be present, and respect the mountains. Always. With Michael’s help, I solved my problem and climbed on, and we stood on the summit of Mt. Muir at 5:30 PM. From this spot we were treated to the final gasps of the sun as it succumbed to the horizon to the west, and we celebrated with a Toblerone bar (cigars seemed inappropriate). Muir was our 4th peak of the day (and 4th 14er of the weekend), and the heavy lifting of our day was behind us. Donning our headlamps, we made our way down the Whitney Trail’s 99 switchbacks with our hands in our pockets, chatting the whole way. We talked of the great things we’d enjoyed on that day, and of the great things we had planned. All very big, because it’s not right to bring small thoughts into the mountains. We provided aid to a few parties on our descent, helping our fellow travelers with water and headlamp batteries and directions. Karma is a good thing to build in the mountains – I’ve been on both sides, and sincerely hope to bring more to the mountains and my follow adventurers than I take away. Michael and I arrived at the trailhead at 10:30 PM, 17 hours from when we started. Moving time was around 13:45 hours, with stops for water, food breaks, summits, and Toblerone celebrations filling in the rest. A day that will forever be etched in my memory! 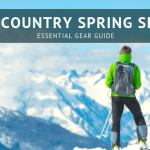 I can’t remember a time where so much came together in the mountains at once – our weather, gear, nutrition, route, and execution were all on point, and the day was without a single notable miscue. I can only hope to build on this experience this upcoming summer, and continue to enjoy great times in the mountains with friends.